It seems our customers are firing on all cylinders right now, with promotional print such as postcards and business cards flying off the print press, while wedding stationery is also still in peak demand. It means this week our customer creations are a real assortment, all with plenty of design ideas to help inspire you! Sophia might be the first narrowboat studio dwelling customer to feature on our blog! The freelance illustrator is always cruising a canal in the UK, which is why her business cards reflect Sophia and her work perfectly. They even feature a few paintings of hers currently being exhibited in Cornwall! Caroline is back again with another wonderful wedding creation. Gold foil wedding stationery is just so trendy right now, and combined with dainty exotic florals, it’s the perfect destination wedding look. Leicester based doodler Claire Hardwick designs illustrated paper goods under her business name Little m, which is named after her little boy Max. Each print Claire creates starts as a pencil sketch which she then digitalises and colours. These branding postcards will be available for free at her stand this weekend at The Manor Tur Langton. Fashion, beauty, travel, lifestyle and London enthusiast Hayley prepped her gorgeous brush lettered wedding invitations with delicate white bows and of course the on trend botanical must-have, eucalyptus leaves. Simple, chic and stunning! We just hope the eucalyptus survived the post! These adorable party pieces with a chocolate sweet stuck on were designed by Zoe for her lucky sister’s hen do. Plymouth based Zoe creates quirky illustrated greeting cards and stationery, and loves all things colourful and funny, so you can see how these party pieces show off what she likes right!?! Yorkshire based Tash Bentley loves photography, film, writing, and as you can see, designing too! She works in a comic and board game shop by day and managed to fit in greeting card and freelance graphic design as well. We love these Blade Runner themed cards! Small craft business owner Amy Elizabeth shows us the incredible detail in her work this week with this lovely close up of a rustic table plan. The simple typography, subtle florals and greenery are a perfect combination. Which creation sticks out the most for you? 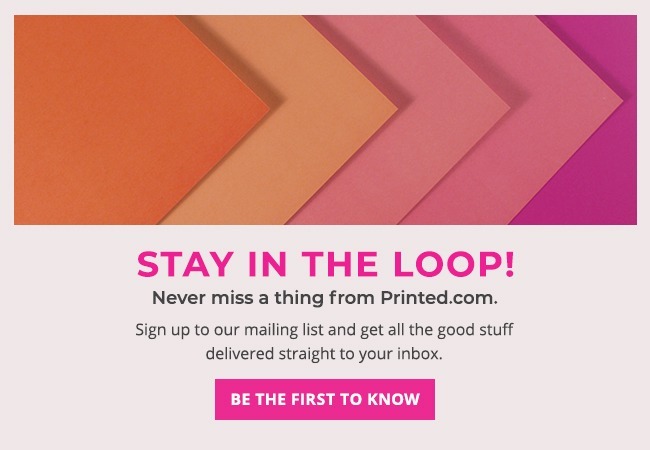 Let us know by commenting and you’ll receive printed.com points! If you fancy showing off, then please pop us a pic of your work and tweet @printed_com, check us out on Instagram printedcom, and visit our Facebook page to give us a like. That bear is so cute! Love the postcards by Little m! sophia’s business cards really caught my eye – so creative, awesome! Such an adorable Bear postcard! Meet the winner of our Goodwill Greeting Card Competition!